The Whitsundays are known for their 74 islands, fringing coral reefs and the swirling sands of Hill Inlet and Whitehaven beach. But during the wet season which is between December and March, the islands offer a new attraction and these are the freshwater falls that spring to life after a deluge of rain. After a downpour you will see water cascading over rocks all over the islands. In some of the more popular anchorages you can find some pretty impressive rock pools and waterfalls, creating a whole new experience to your Whitsunday island adventure. 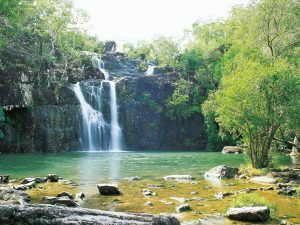 Located in one of the most sheltered anchorages in the Whitsundays, Nara Inlet on Hook Island boasts a pretty impressive waterfall in the wet season. Travel to the end of the inlet, past the Ngaro Walking Trail to indigenous cave paintings, and you will find a waterfall cascading into the inlet. Just a short climb up you will find a few small rock pools, that are perfect to take a dip in. Another popular anchorage on Hook Island is Stonehaven Bay. 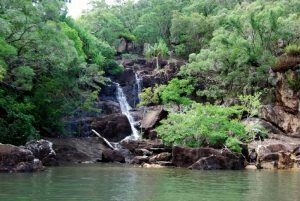 Just inside the southern tip of anchor point you will find one of the larger waterfalls in the Whitsundays. Often heard before it is seen the fresh water falls down the rocks in the crevice of the island creating a plethora of waterfalls and rock pools as you climb up. Please note there is no dedicated path and to tread carefully if climbing up the falls. While not as impressive as the Nara or Stonehaven waterfalls, you can find a little waterfall in luncheon bay on Hook Island. This small fall (which could more adequately be described as an impressive natural freshwater shower) drops into a small, spa-like, rock pool that can comfortable fit two seated adults. This popular local destination located in the Conway Ranges on the Whitsunday mainland is accessible by car. From Conway Road follow the signs and turn onto Saltwater Creek Road. Note that the entrance to the falls can sometimes flood due to a low lying creek. The biggest waterfall in the Whitsundays with largest swimming hole set amongst a beautiful sub-tropical rainforest full of birds, lizards, turtles and small fish. To the right of the falls is a little un-official track that you can follow to the top to enjoy the rock pools above. Please note that jumping off the falls is strictly prohibited. 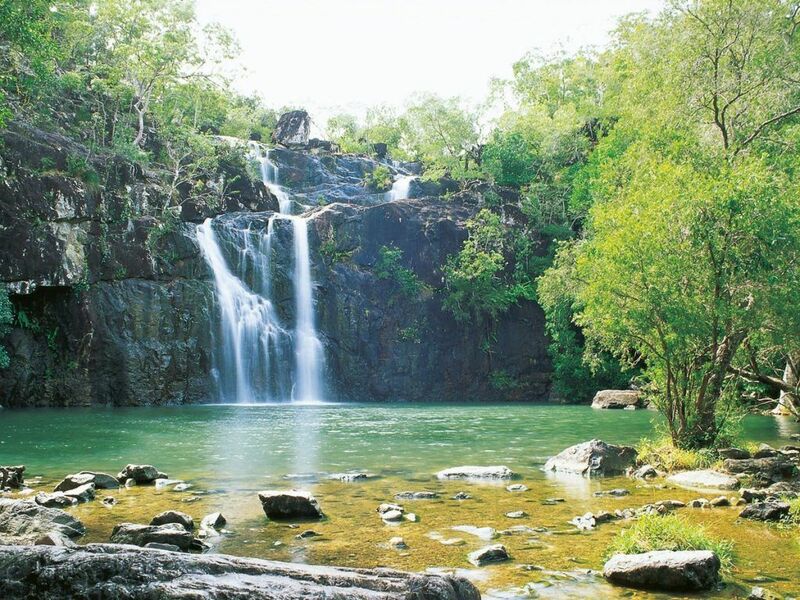 We would love to see any of your Whitsunday waterfall adventures. You can do this by tagging @abellpointmarina in any social media images and using the #stayplayexplore hashtag. We also recommend taking insect repellent on all your waterfall adventures as with the rain the mosquitos like to come out and play too.